Learn more about common drainage problems and their solutions. There are many common lawn drainage problems that homeowners have questions about, and Edward’s Lawn is here to answer those questions. If you have questions about downspouts, water from your neighbor’s lawn, or excess moisture in your basement due to a slope in your landscape, continue reading. A common drainage issue for homeowners is when the downspouts in their landscape don’t have any place to drain. When the downspouts aren’t directed anywhere to drain properly, the excess water can kill nearby plants. The best solution is to direct drainage over a grassy swale in the lawn to flow to an overflow area with plants that need more water. Another solution is to use plastic corrugated tubes to direct drainage. If you notice excess water near your shared fence with a neighbor, they may be inadvertently directing water from their system onto your property. While it is likely an accident, this can quickly can a drainage issue for your lawn. It’s important to talk to your neighbor and figure out a solution that works for both of you. Some neighbors choose to share the cost of an underground drainage system, such as a French drain or dry well, to direct water to a better area of the landscape. Working together is a good way to ensure you both avoid drainage problems and the water is directed to a location where it won’t do any harm to your lawn. Water may flow towards your foundation and seep into your basement if your landscape has a slope, or your lawn has been improperly graded so the water flows toward your home. 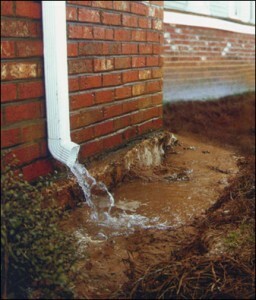 To ensure the water flows away from your foundation, you must change your drainage system. If a large slope is causing the excess water in your basement, an underground drainage system is the best solution. These drainage systems are also typically combined with a sump pump, so they will be extra effective for keeping away out of your home. This entry was posted on Thursday, July 19th, 2018 at 4:29 pm. Both comments and pings are currently closed.